Bird Fleming is a professional percussionist, educator, and performer. 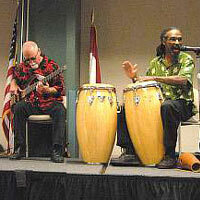 He is well versed in many styles of ethnic percussion: West African, South American, and Caribbean. He has studied with Simbo Wushu, Dennis Lee, Bernard Wry, Agustin Romero Diza from Havana Cuba, Cheikh Gueye, Zak Diop, and Abdullah Camara from Senegal, West Africa; El Hajjii Abubakari Lunna-Wombie and Guideon Foli Alorwoyie from Ghana; Danny Hines, Moacyr Machinni, and Marcus Santos of Brazil.